In their nearly 80 years of friendship, Betty Cooper and Veronica Lodge have been through a lot together. They've endured the harsh spotlight of pop culture's greatest love triangle and somehow avoided high cholesterol despite a steady diet of food and shakes from Pops' Chock'lit Shoppe. They even survived the Archie: To Riverdale And Back Again TV movie. Come this December, they will face something they have never gone through in the nearly eight decades since they first graced the pages of Pep Comics: Senior Year! Betty & Veronica #1 kicks off a new miniseries from writer Jamie Rotante in which B&V grapple with the thrilling uncertainty all teenagers eventually face as high school life nears its grand finale. The series will follow the November release of Archie #700, a milestone issue for Archie Comics even if it does take combining the stellar Mark Waid/Fiona Staples Archie series to reach that lofty number. According to Rotante, the idea behind the book was fairly basic. 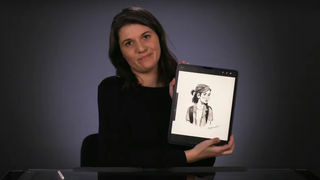 "Senior year is stressful, and it brings forth so many new challenges and expectations for students," she told SYFY WIRE in her first in-depth interview about the upcoming series. "And I thought it would be a good idea to bring what teens go through at this time to light." Rotante is a native Riverdaler (Riverdalian?). A lifelong fan of the Archie books, her first gig with Archie Comics was as a proofreader. She then worked her way up to editing before landing the writing job on the superbly wild biker girl adventure Betty & Veronica: Vixens, which is coming to an end with issue #10. Now she gets to launch a new B&V book that skews much closer to the characters she fell in love with a child. Of course, given that the graduation rate at Riverdale High School is atrocious, can we really expect Betty and Veronica to actually get handed diplomas? Rotante shares more detail on that and other aspects of the story she plans to tell in an interview we conducted via email. She also revealed her perfect playlist for B&V's senior year. Putting Betty and Veronica as seniors in high school makes so much sense, it's amazing no one has ever done it before. Why did you want that to be the backdrop for this series? Precisely for that reason — we've never done it before! High school has always been the backdrop of Archie Comics, but by having them be seniors this time around, it places school more in the forefront. In my personal life, I do some volunteer work as a mentor, so I spend a good portion of my year working one-on-one with a teenage girl who's getting ready for her senior year. And it reminded me of just how much pressure we place on teens' shoulders. I think it's important to realize that and not discount their opinions or concerns. What can we expect the relationship between these two to be like? I love that on the Marguerite Sauvage cover for issue #1, they're holding hands. Their friendship is on full display. Is that a good indicator of the direction you want to take this book? Absolutely. This series will focus primarily on their friendship and how it endures throughout their senior year. That's not to say it's always going to be amazing or happy, they — like most friends do — will hit some rough patches, but those spotty moments just serve as a testament to how strong the bond between them is. What can you tell us about specific storylines we can expect? An angle I'm taking is mapping each issue out by season to cover all quarters of the school year. Each new season and semester will bring with it a new challenge. They'll deal with the stress of deadlines, applications, juggling their school work with extracurricular activities and their social lives. They'll also encounter relationship drama and some things that really put their friendship to the test. The idea is that their senior year is the first year where they're really becoming who they want to be — and that could change the courses of their individual futures. The story starts out with them wanting to go to college together, and thinking that they will, but life might have other ideas for them. After writing a very different Betty and Veronica in the Vixens series, were you excited to take on a series that is a bit closer to the characters readers have known for decades? Vixens was fun because it was so out there, so now it's exciting to take a step back and approach things from a more realistic P.O.V. In Betty & Veronica: Vixens, I got the chance to write the girls doing things I WISH I had the courage to do. In this series, they're living through some things I, and other young women I know, have been through, or are currently going through. And I hope readers will relate to a lot of it, as well. Given that "comic book time" can be quite malleable — especially in Riverdale — is there really a chance we may actually see them graduate? Betty & Veronica: Vixens had almost an entirely female creative team behind it. Will you be working with a female artist on B&V? Do you think that it would be better for the book to have an all-female creative team? We haven't announced the artist just yet but I CAN confirm that it's female. I think it's important to have equal representation of ALL genders working on our books — and I think having a fully-female team is fantastic, but I also wouldn't want anyone to feel like they have to work on a book solely because it "fits" the gender they subscribe to. You've been with Archie a long time, starting as an editorial assistant and proofreader, then as editor. Now you're launching a brand new Betty and Veronica series. How did the other work you've done for the company help you prepare for this gig? Being a proofreader means I read tons and tons of Archie comics! It also helps that I was an avid Archie collector (esp. B&V books!) during my adolescence, so I have years of reading these stories and understanding the characters' personality traits and backgrounds. I'm privileged to have been able to read scripts from so many different writers and see them go from pitch to final product, which has given me a good idea of what works and I what I enjoy reading. Because every senior year needs an epic playlist, give me a five-song playlist for Betty & Veronica's senior year. Go!